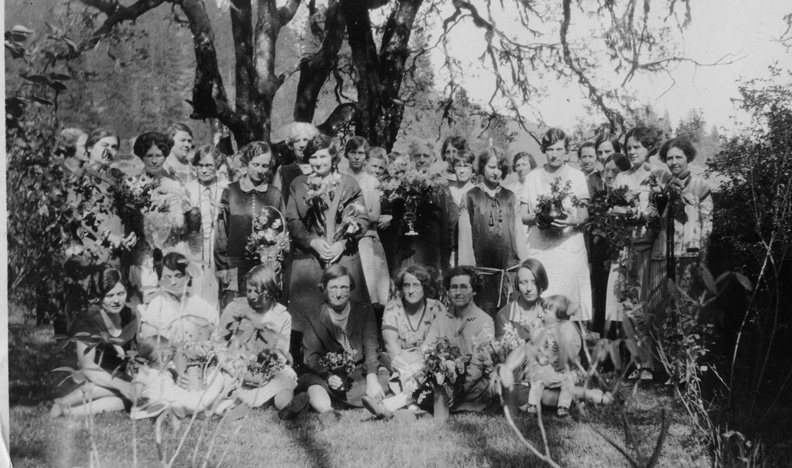 One of the most unique botanical areas in Oregon may not exist in its natural condition today if it had not been for the efforts of eight women who met in the spring of 1927 to form a garden club in Illinois Valley. 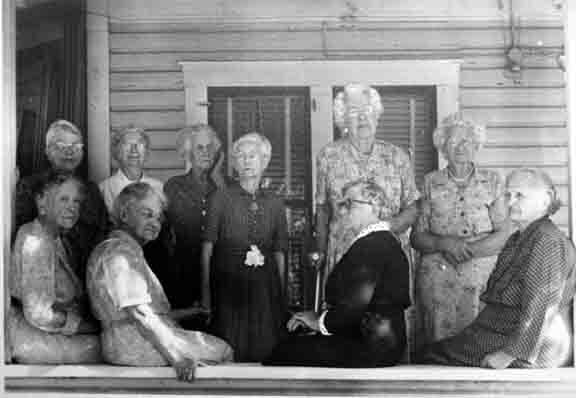 On the afternoon of their first meeting, while they shared their ideas and plans for the club, the last thing they might have imagined was that in ten years they would be the leaders of a preservation movement that continues today. 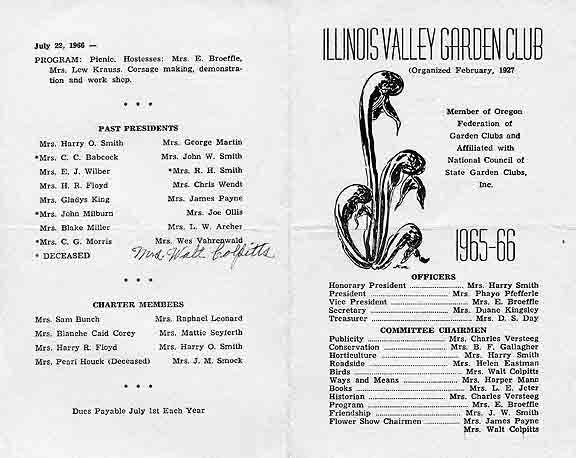 The club was given the name of “Illinois Valley Garden Club” and because they met on Friday afternoons, they also were known as the “Friday Afternoon Garden Club”. 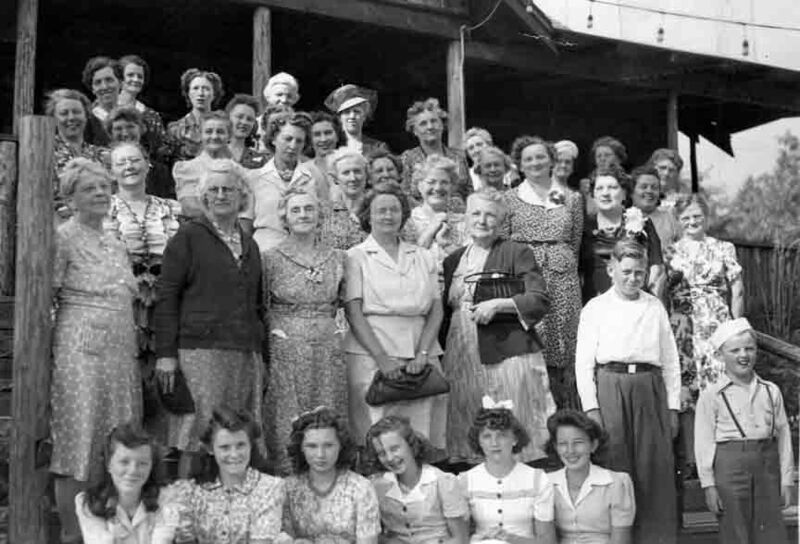 They had eight members when the club started in February, 1927 and by December the membership had grown to thirty two, the majority of which were homemakers. The group decided that their motto would be: To conserve and enhance our natural beauty, to promote better gardens for better homes and through study to gain a more comprehensive knowledge of horticulture. It may have been this philosophy of self-improvement that guided them in the direction of being involved in the establishment of the Rough and Ready Forest State Park, located five miles south of Cave Junction. During the first years of the clubs history, they used their membership fees to purchase dozens of books for the local library, organized community beautification projects, and developed a schedule of monthly programs to improve their skills in gardening. 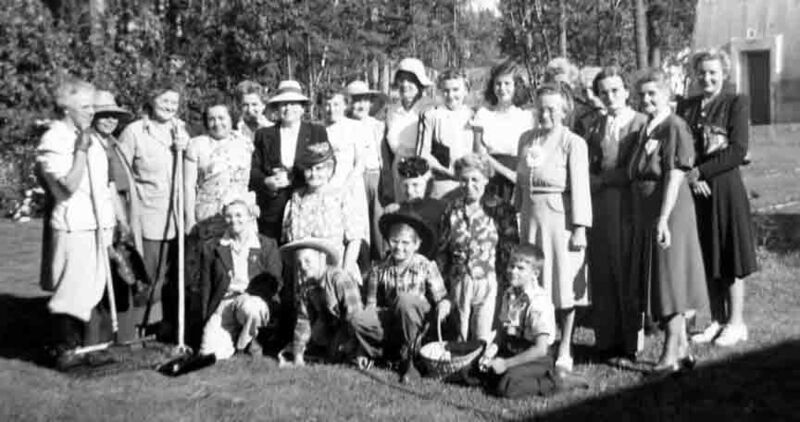 Their self-improvement programs included exploring the uses of wildflowers in landscaping and, as they learned more about native plants in the valley, they began to realize the uniqueness of several areas. 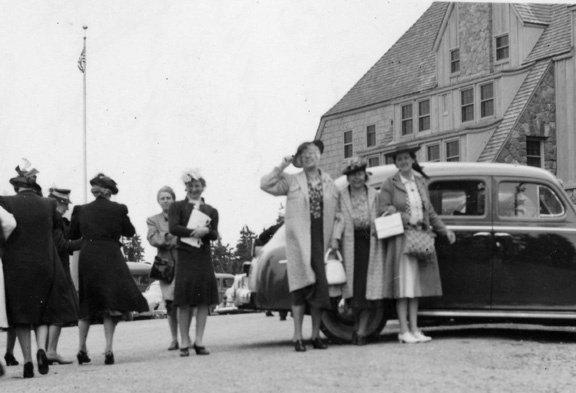 One of these would later become the focus of their preservation drive. A wheelchair accessible trail takes visitors through the unusual botanical landscapes of Rough and Ready Forest State Park, Cave Junction, Oregon. The events that put the spurs to their preservation effort began with the paving of the Redwood Highway (Highway 199). 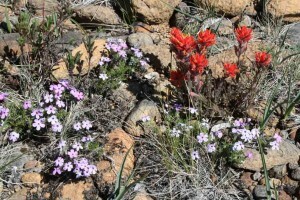 Some entrepreneurs viewed the uniqueness of the semi-barren landscape around Rough and Ready Creek as horticultural gold mine and this resulted in many rare plants being collected for commercial sale, sometimes being hauled away by the truckload. When the members of the garden club became aware that this was happening they knew that they needed to take action to prevent further damage. The club paid for and erected the first signs in the state to prohibit the picking or digging of wildflowers. At the same time they were working to protect wildflowers in the area around Rough and Ready Creek, they contacted Sam Boardman, the Superintendent of Oregon State Parks and pressed for him to take over the situation and establish a state park at this locality. They also appealed for help from the Oregon Federation of Garden Clubs who had been instrumental in helping establish waysides, state parks and forested travel corridors in other parts of Oregon. 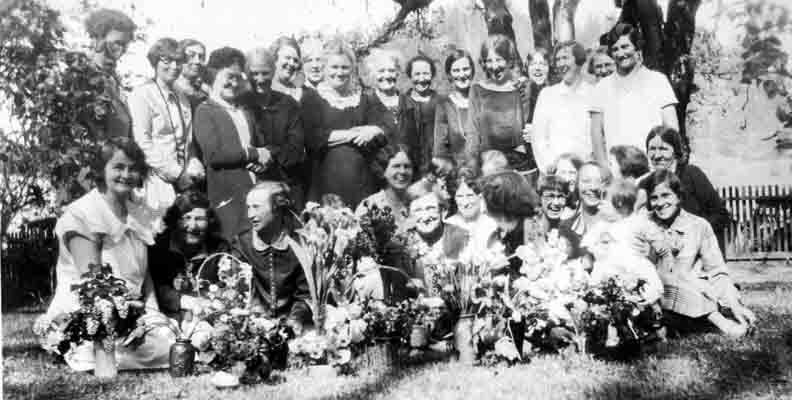 In 1938, during the height of the depression, the women of the Illinois Valley Garden Club achieved their objective and 90 acres of Bureau of Land Management (BLM) land was set aside as the Oregon State Rough and Ready Creek Forest Wayside. A more permanent transfer was accomplished in 1962 when the property was patented permanently to the State of Oregon as an official part of the State Park system. In 1940, barely three years after the Rough and Ready Forest Wayside State Park was established, 78 acres was withdrawn and used for the construction of the Illinois Valley Airport. More recently, the relocation of the Highway 199 bridge over Rough and Ready Creek has shaved off another segment of the State Park. The women of the Illinois Valley Garden Club were way ahead of their time. More than 20 years after the establishment of the Rough and Ready Forest Wayside State Park, the area was visited by Dr. Edgar Wherry, head of the Department of Botany at the University of Pennsylvania, who had developed an interest in relationships between soil chemistry and plant growth while working as the assistant curator of mineralogy at the U.S. National Museum in Washington, D.C in 1913. During his visit he reportedly declared the Rough and Ready Creek drainage as as having only one other area in the United States to compare with it, the famous “Pine Barrens” of New Jersey. The uniqueness of this area is influenced by both the geology and geography. Rough and Ready Creek looking west toward Rough and Ready Creek Canyon seen in the left background. The rock and soils for this terrain comes from Rough and Ready Creek canyon, which can be seen about two miles to the west of Highway 199. The entire watershed of this creek is contained within a massive outcrop of mantle rock. Most people in the region refer to this mantle rock as serpentine although the key characteristic of these rocks is the lack of minerals that are essential to plant growth. The rocks break down to form soil but this soil lacks nutrients that area essential for plant growth. The rocks being washed out of Rough and Ready Canyon have spread out over the relatively flat terrain between the mouth of the canyon and Illinois River, a distance of about three miles. Over the years, these rocks have accumulated to form a deep pile of river rock, gravel and sand, all of which originates from serpentine. This gravel and sand is not good at holding water and drains quickly after a rain creating artificially arid growing conditions for plants. The combination of nutrient deficient and rapidly draining soils is what creates the unique plant community of the Rough and Ready Forest Wayside State Park. The region is characterized by a desert-like landscape with a dissipated forest of dwarf pines that appear to be struggling to survive in an area that gets 50 inches of rain annually. The members of the Garden Club were right. This is a truly remarkable place. 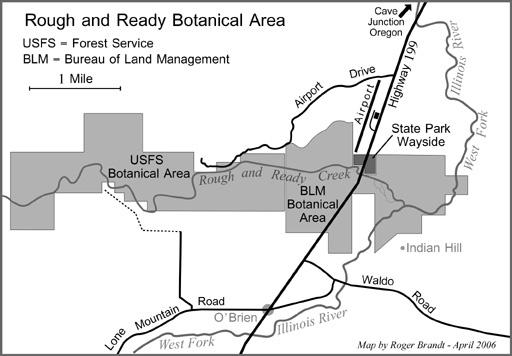 Map showing botanical protected areas around Rough and Ready Forest State Park . Others have slowly realized this uniqueness and it is now understood that the Rough and Ready Creek watershed is perhaps the most significant in the state in terms of having the greatest concentration of rare plants in Oregon. One local naturalist described the area as a meeting ground of extremely divergent plant communities. For example: Rabbitbrush, a desert plant, grows beneath Port Orford cedar, a coastal/cool riparian tree. 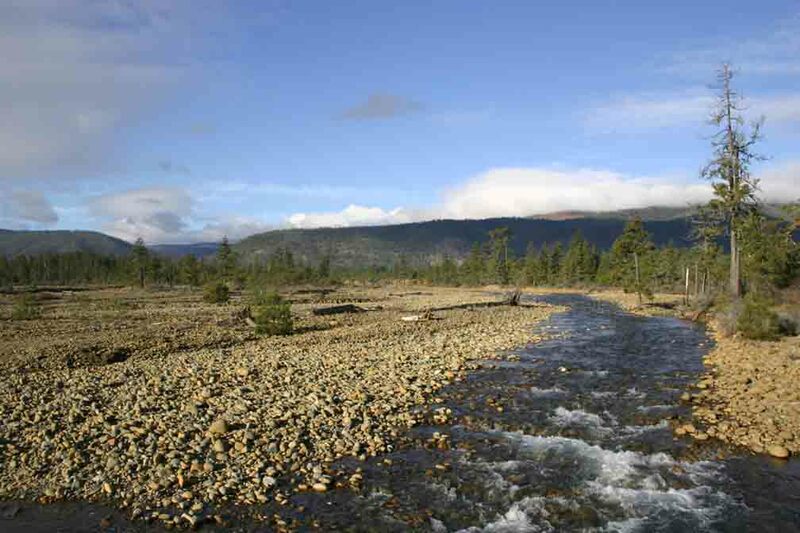 The same Western white pine you find on cold, snowy slopes at Crater Lake is found at the Rough and Ready Creek’s headwaters, located 10 miles from Highway 199 at an elevation of about 4,000 feet. Here you find western hemlock and Port Orford cedar forests juxtaposed with open Jeffrey pine woodlands. The garden club took the first step that began a cascade of other protective measures. In a way you could say they started a movement. Since that time the Bureau of Land Management has designated an 1,164 acre Rough and Ready Area of Critical Environmental Concern (ACEC) and the Forest Service designated additional acreage into the Rough and Ready Special Interest Area (SIA). The Nature Conservancy recently added another 110 acres of protected area along the creek near the mouth of the canyon. 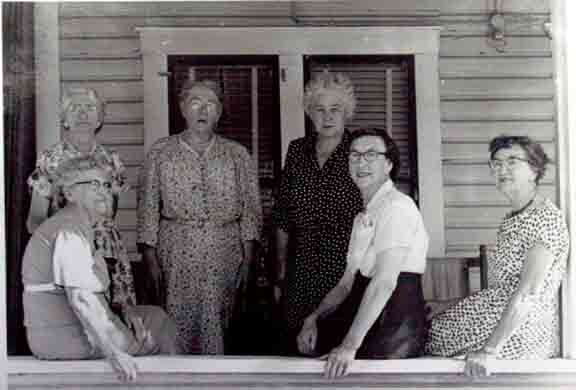 The Rough and Ready Forest Wayside State Park was designated because of the efforts of a group of housewives who formed a club to better themselves and in doing so were able take steps that bettered Oregon. Location of Rough and Ready Forest State Park: Mile post 34, five miles from the south end of Cave Junction. A wheelchair accessible trail is available and has a surface of decomposed granules of granite, which form a fairly solid surface suitable for most wheelchairs. The parking area still had rough ground at the time this article was written. 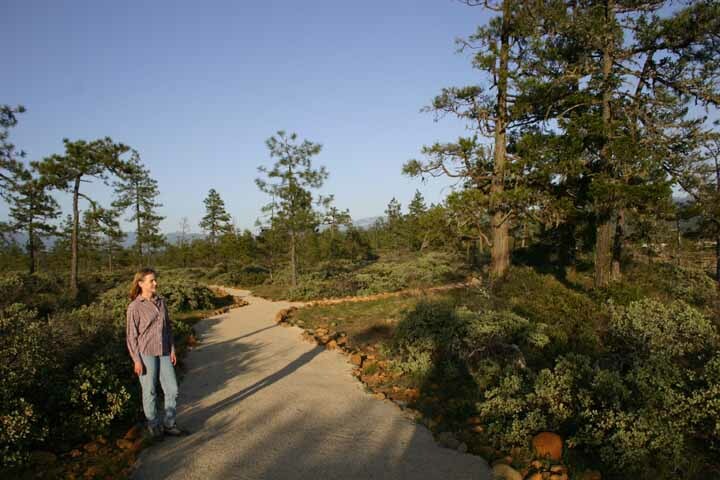 A variety of organizations offer nature walks at the State Park in May by the Native Plant Society, Sierra Club, Siskiyou Field Institute, Illinois Valley Garden Club, and Forest Service. According to the book on Oregon Geographic Names, the stream was named in the 1850s by gold mines for President Zachary Taylor, nicknamed “Rough and Ready” when he was a general in the Mexican War. 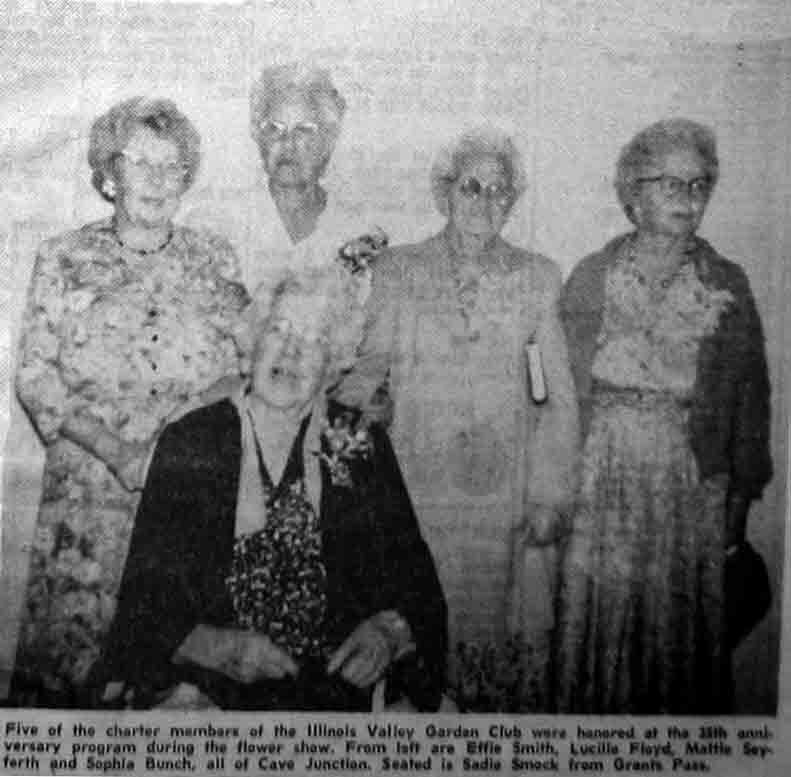 Mrs. Effie Smith of the Illinois Valley Garden Club served as the state president of the Oregon Federation of Garden Clubs.